Orange Beach, AL beach homes are typically large homes with more bedrooms than your typical home. This is for obvious reasons and there are not usually many for sale at any given time. The cost for a home on the beach in Orange Beach is high, even in the tough economic times. 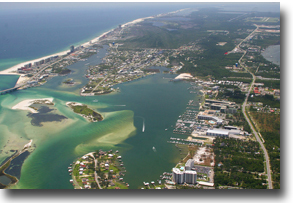 Orange Beach does not have much gulf frontage and can only hold some many beach houses on our beautiful Gulf of Mexico. Below is a list of all of the homes for sale in Orange Beach Alabama that are directly on the Gulf of Mexico. These homes on the beach are not only great for a week at the beach with friends and family, they make great investments. This is even more evident when you factor in the current low cost of purchasing a home on the beach. The majority of beach homes for sale in Orange Beach, AL will make a great investment from appreciation, as well as, rental income. Please let us know if you would like further info for beach homes or any other, homes, condos or real estate along the Gulf Coast or would like to schedule a private viewing by emailing info@condoinvestment.com or by calling (251) Area-Pro for immediate assistance. The Cottages at Romar is one of the newest subdivisions on the Alabama Gulf Coast. With a variety of sizes to choose from, these cottages offer either direct Gulf-front views, are surrounding the center pool area, or are scattered around the back of the community. The Gulf-front houses offer private pools in addition to the community pool and bathhouse. There are some houses currently for sale and others are still being built, so you have to act fast if you want to live in what promises to be one of the most luxurious communities on the coast!